Big Bang Theory of the Universe Suggests The Universe Was Created From A Big Bang Singularity. The big bang theory of the universe. The Big Bang theory is a scientific theory that the universe emerged from a tremendously dense and hot state. The Big Bang happened about 13.7 billion years ago. The Big Bang theory is based on the observations indicating the expansion of space (in accord with the Robertson-Walker model of General relativity) as indicated by the Hubble Redshift of distant galaxies taken together with the cosmological principle. According to the Big Bang, the universe emerged from an extremely dense and hot state (bottom). Since then, space itself has expanded with the passage of time, carrying the galaxies with it. Extrapolated into the past, these observations show that the universe has expanded from a state in which all the matter and energy in the universe was at an immense temperature and density. Physicists do not widely agree on what happened before this, although general relativity predicts a gravitational singularity (for reporting on some of the more notable speculation on this issue, see cosmogony). The term Big Bang is used both in a narrow sense to refer to a point in time when the observed expansion of the universe (Hubble's law) began - calculated to be 13.7 billion (1.37 × 1010) years ago (±2%) - and in a more general sense to refer to the prevailing cosmological paradigm explaining the origin and expansion of the universe, as well as the composition of primordial matter through nucleosynthesis as predicted by the Alpher-Bethe-Gamow theory. From this model, George Gamow in 1948 was able to predict, at least qualitatively, the existence of cosmic microwave background radiation (CMB). The CMB was discovered in 1964 and further corroborated the Big Bang theory, giving it an additional advantage over its chief rival, the steady state theory. History of the Big Bang theory. The Big Bang theory developed from observations of the structure of the universe and theoretical considerations. Observationally, it was determined that most spiral nebulae were receding from Earth, but those who made the observation weren't aware of the cosmological implications, nor that the supposed nebulae were actually galaxies outside our own Milky Way. In 1927, Georges Lemaître, a Belgian Roman Catholic priest, independently derived the Friedmann-Lemaître-Robertson-Walker equations from Albert Einstein's equations of General relativity and proposed, on the basis of the recession of spiral nebulae, that the universe began with the "explosion" of a "primeval atom"-what was later called the Big Bang. In 1929, Edwin Hubble provided an observational basis for Lemaître's theory. He discovered that, seen from Earth, light from other galaxies is redshifted in direct proportion to their distance from the Earth. This fact is now known as Hubble's law. Given the cosmological principle whereby the universe, when viewed on sufficiently large distance scales, has no preferred directions or preferred places, Hubble's law suggested that the universe was expanding, contradicting the infinite and unchanging static universe scenario developed by Einstein. 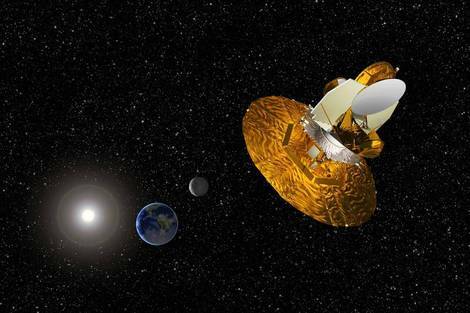 Artist's depiction of the WMAP satellite gathering data to help scientists understand the Big Bang. This idea allowed for two main opposing possibilities. One was Lemaître's Big Bang theory, advocated and developed by George Gamow. The other possibility was Fred Hoyle's steady state model in which new matter would be created as the galaxies moved away from each other. In this model, the universe is roughly the same at any point in time. It was actually Hoyle who coined the name of Lemaître's theory, referring to it sarcastically as "this big bang idea" during a program broadcast on March 28, 1949, by the BBC Third Programme. Hoyle repeated the term in further broadcasts in early 1950, as part of a series of five lectures entitled The Nature of Things. The text of each lecture was published in The Listener a week after the broadcast, the first time that the term "big bang" appeared in print. While Hoyle's "steady state" and Lemaître's "Big Bang" were the two most popular models used to explain Hubble's observations, other ideas were also proposed as well. Some of these alternatives included the Milne model, Richard Tolman's oscillatory universe, and Fritz Zwicky's tired light hypothesis. For a number of years, the support for the "steady state" and "Big Bang" theories was evenly divided. However, the observational evidence began to support the idea that the universe evolved from a hot dense state. Since the discovery of the cosmic microwave background radiation in 1964, it has been regarded as the best theory of the origin and evolution of the cosmos. Virtually all theoretical work in cosmology now involves extensions and refinements to the basic Big Bang theory. Much of the current work in cosmology includes understanding how galaxies form in the context of the Big Bang, understanding what happened at the Big Bang and reconciling observations with the basic theory. Huge advances in Big Bang cosmology were made in the late 1990s and the early 21st century as a result of major advances in telescope technology in combination with large amounts of satellite data such as that from COBE, the Hubble Space Telescope and WMAP. Such data have allowed cosmologists to calculate many of the parameters of the Big Bang to a new level of precision and led to the unexpected discovery that the expansion of the universe appears to be accelerating. Overview of the Big Bang theory. Based on measurements of the expansion of the universe using Type 1a supernovae, measurements of the lumpiness of the Cosmic microwave background, and measurements of the correlation function of galaxies, the universe has a calculated age of 13.7 ± 0.2 billion years. The agreement of these three independent measurements is considered strong evidence for the so-called CDM model that describes the detailed nature of the contents of the universe. The early universe was filled homogeneously and isotropically with an incredibly high energy density and concomitantly huge temperatures and pressures. It expanded and cooled, going through phase transitions analogous to the condensation of steam or freezing of water as it cools, but related to elementary particles. Approximately 10-35 seconds after the Planck epoch a phase transition caused the universe to experience exponential growth during a period called cosmic inflation. After inflation stopped, the material components of the universe were in the form of a quark-gluon plasma (also including all other particles-and perhaps experimentally produced recently as a quark-gluon liquid) in which the constituent particles were all moving relativistically. As the universe continued growing in size, the temperature dropped. At a certain temperature, by an as-yet-unknown transition called baryogenesis, the quarks and gluons combined into baryons such as protons and neutrons, somehow producing the observed asymmetry between matter and antimatter. Still lower temperatures led to further symmetry breaking phase transitions that put the forces of physics and elementary particles into their present form. Later, some protons and neutrons combined to form the universe's deuterium and helium nuclei in a process called Big Bang nucleosynthesis. As the universe cooled, matter gradually stopped moving relativistically and its rest mass energy density came to gravitationally dominate that of radiation. After about 300,000 years the electrons and nuclei combined into atoms (mostly Hydrogen); hence the radiation decoupled from matter and continued through space largely unimpeded. This relic radiation is the cosmic microwave background. Over time, the slightly denser regions of the nearly uniformly distributed matter gravitationally attracted nearby matter and thus grew even denser, forming gas clouds, stars, galaxies, and the other astronomical structures observable today. The details of this process depend on the amount and type of matter in the universe. The three possible types are known as cold dark matter, hot dark matter, and baryonic matter. The best measurements available (from WMAP) show that the dominant form of matter in the universe is cold dark matter. 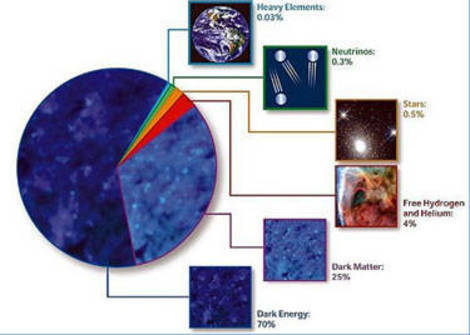 The other two types of matter make up less than 20% of the matter in the universe. The universe today appears to be dominated by a mysterious form of energy known as Dark energy. Approximately 70% of the total energy density of today's universe is in this form. This dark energy causes the expansion of the universe to deviate from a linear velocity-distance relationship, observed as a faster than expected expansion at very large distances. Dark energy in its simplest formulation takes the form of a cosmological constant term in Einstein's field equations of general relativity, but its composition is unknown and, more generally, the details of its equation of state and relationship with the Standard Model of particle physics continue to be investigated both observationally and theoretically. All these observations are encapsulated in the CDM model of cosmology, which is a mathematical model of the Big Bang with six free parameters. Mysteries appear as one looks closer to the beginning, when particle energies were higher than can yet be studied by experiment. There is no compelling physical model for the first 10-33 seconds of the universe, before the phase transition that Grand unification theory predicts. At the "first instant", Einstein's theory of gravitation predicts a gravitational singularity where densities become infinite. To resolve this paradox, a theory of quantum gravitation is needed. Understanding this period of the history of the universe is one of the greatest Unsolved problems in physics. Theoretical underpinnings of the Big Bang theory. The universality of physical laws. When first developed, these ideas were simply taken as postulates, but today there are efforts underway to test each of them. Tests of the universality of physical laws have found that the largest possible deviation of the fine structure constant over the age of the universe is of order 10-5. The isotropy of the universe that defines the Cosmological Principle has been tested to a level of 10-5 and the universe has been measured to be homogeneous on the largest scales to the 10% level. There are efforts underway to test the Copernican Principle by means of looking at the interaction of galaxy groups and clusters with the CMB through the Sunyaev-Zel'dovich effect to a level of 1% accuracy. The Big Bang theory uses Weyl's postulate to measure time unambiguously at any point as the "time since the Planck epoch". Measurements in this system rely on conformal coordinates in which so-called comoving distances and conformal times remove the expansion of the universe, parameterized by the cosmological scale factor, from consideration of Spacetime measurements. The comoving distances and conformal times are defined so that objects moving with the cosmological flow are always the same comoving distance apart and the particle horizon or observational limit of the local universe is set by the conformal time. As the universe can be described by such coordinates, the Big Bang is not an explosion of matter moving outward to fill an empty universe; what is expanding is space itself. It is this expansion that causes the physical distance between any two fixed points in our universe to increase. Objects that are bound together (for example, by gravity) do not expand with spacetime's expansion because the physical laws that govern them are assumed to be uniform and independent of the metric expansion. Moreover, the expansion of the universe on today's local scales is so small that any dependence of physical laws on the expansion is unmeasurable by current techniques. Observational evidence of the Big Bang theory. It is generally stated that there are three observational pillars that support the Big Bang theory of cosmology. These are the Hubble-type expansion seen in the redshifts of galaxies, the detailed measurements of the cosmic microwave background, and the abundance of light elements. (See Big Bang nucleosynthesis.) Additionally, the observed correlation function of large-scale structure of the cosmos fits well with standard Big Bang theory. Big Bang theory and Hubble's law of expansion. 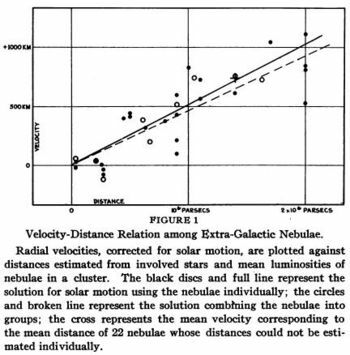 Hubble's original data from his 1929 paper. H0 is Hubble's constant, measured to be (70 +2.4/-3.2) km/s/Mpc by the WMAP probe. The Hubble's law observation has two possible explanations. One is that we are at the center of an explosion of galaxies, a position which is untenable given the Copernican principle. The second explanation is that the universe is uniformly expanding everywhere as a unique property of Spacetime. This type of universal expansion was developed mathematically in the context of General relativity well before Hubble made his analysis and observations, and it remains the cornerstone of the Big Bang theory as developed by Friedmann-Lemaître-Robertson-Walker. Big Bang Cosmic microwave background radiation. 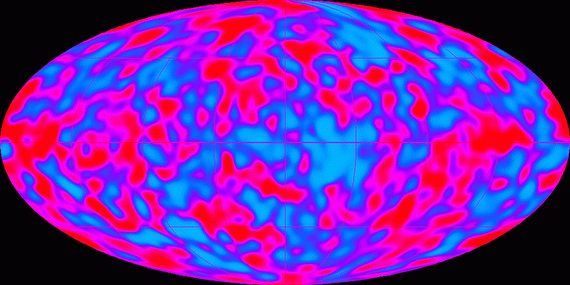 WMAP image of the cosmic microwave background radiation. The Big Bang theory predicted the existence of the cosmic microwave background radiation or CMB which is composed of photons first emitted during baryogenesis. Because the early universe was in thermal equilibrium, the temperature of the radiation and the plasma were equal until the plasma recombined. Before atoms formed, radiation was constantly absorbed and re-emitted in a process called Compton scattering: the early universe was opaque to light. However, cooling due to the expansion of the universe allowed the temperature to eventually fall below 3,000 K at which point electrons and nuclei combined to form atoms and the primordial plasma turned into a neutral gas. This is known as photon decoupling. A universe with only neutral atoms allows radiation to travel largely unimpeded. Because the early universe was in thermal equilibrium, the radiation from this time had a blackbody spectrum and freely streamed through space until today, becoming redshifted because of the Hubble expansion. This reduces the high temperature of the blackbody spectrum. The radiation should be observable at every point in the universe to come from all directions of space. In 1964, Arno Penzias and Robert Wilson, while conducting a series of diagnostic observations using a new microwave receiver owned by Bell Laboratories, discovered the cosmic background radiation. Their discovery provided substantial confirmation of the general CMB predictions-the radiation was found to be isotropic and consistent with a blackbody spectrum of about 3 K-and it pitched the balance of opinion in favor of the Big Bang hypothesis. Penzias and Wilson were awarded the Nobel Prize for their discovery. In early 2003, the results of Wilkinson Microwave Anisotropy satellite (WMAP) were released, yielding what were at the time the most accurate values for some of the cosmological parameters. (See cosmic microwave background radiation experiments.) This satellite also disproved several specific cosmic inflation models, but the results were consistent with the inflation theory in general. Abundance of primordial elements: Big Bang nucleosynthesis. Using the Big Bang model it is possible to calculate the concentration of helium-4, helium-3, deuterium and lithium-7 in the universe as ratios to the amount of ordinary hydrogen, H. All the abundances depend on a single parameter, the ratio of photons to baryons. The ratios predicted (by mass, not by number) are about 0.25 for4He/H, about 10-3 for2H/H, about 10-4 for3He/H and about 10-9 for7Li/H. The measured abundances all agree with those predicted from a single value of the baryon-to-photon ratio. The agreement is relatively poor for7Li and4He, the two elements for which the systematic uncertainties are least understood. This is considered strong evidence for the Big Bang, as the theory is the only known explanation for the relative abundances of light elements. Indeed there is no obvious reason outside of the Big Bang that, for example, the young universe (i.e., before star formation, as determined by studying matter essentially free of stellar nucleosynthesis products) should have more helium than deuterium or more deuterium than3He, and in constant ratios, too. 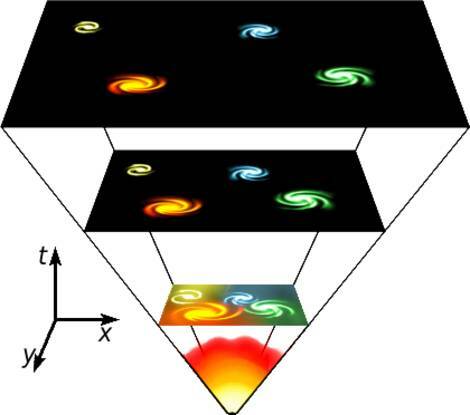 Big Bang theory: Galactic evolution and distribution: large-scale structure of the cosmos, Structure formation, and Galaxy formation and evolution. Detailed observations of the morphology and distribution of galaxies and Quasars provide strong evidence for the Big Bang. A combination of observations and theory suggest that the first quasars and galaxies formed about a billion years after the Big Bang, and since then larger structures have been forming, such as galaxy clusters and superclusters. Populations of stars have been aging and evolving, so that distant galaxies (which are observed as they were in the early universe) appear very different from nearby galaxies (observed in a more recent state). Moreover, galaxies that formed relatively recently appear markedly different from galaxies formed at similar distances but shortly after the Big Bang. These observations are strong arguments against the steady-state model. Observations of star formation, galaxy and quasar distributions, and larger structures agree well with Big Bang simulations of the formation of structure in the universe and are helping to complete details of the theory. Features, issues and problems with the Big Bang theory. While currently there are very few researchers who doubt the Big Bang occurred, in the past the community was divided between supporters of the Big Bang and supporters of alternative cosmological models. Throughout the historical development of the subject, problems with the Big Bang theory were posed in the context of a scientific controversy regarding which model could best describe the cosmological observations. With the overwhelming consenus in the community today supporting the Big Bang model, many of these problems are remembered as being mainly of historical interest; the solutions to them have been obtained either through modifications to the theory or as the result of better observations. Other issues, such as the cuspy halo problem and the dwarg galaxy problem of cold dark matter, are not considered to be fatal as they can be addressed through further refinements of the theory. The Big Bang model admits very exotic physical phenomena that include Dark matter, Dark energy, and cosmic inflation which rely on conditions and physics that have not yet been observed in terrestrial laboratory experiments. While explanations for such phenomena remain at the frontiers of inquiry in physics, independent observations of Big Bang nucleosynthesis, the Cosmic microwave background, large scale structure and Type Ia supernovae strongly suggest the phenomena are important and real cosmological features of our universe. The gravitational effects of these features are understood observationally and theoretically but they have not yet been successfully incorporated into the Standard Model of Particle physics. Though some aspects of the theory remain inadequately explained by fundamental physics, almost all cosmologists accept that the close agreement between Big Bang theory and observation have firmly established all the basic parts of the theory. Big Bang theory: The horizon problem. The horizon problem results from the premise that information cannot travel faster than light, and hence two regions of space which are separated by a greater distance than the speed of light multiplied by the age of the universe cannot be in Causal contact. The observed isotropy of the Cosmic microwave background (CMB) is problematic in this regard, because the horizon size at that time corresponds to a size that is about 2 degrees on the sky. If the universe has had the same expansion history since the Planck epoch, there is no mechanism to cause these regions to have the same temperature. A resolution to this apparent inconsistency is offered by inflationary theory in which a homogeneous and isotropic scalar energy field dominates the universe at a time 10-35 seconds after the Planck epoch. During inflation, the universe undergoes exponential expansion, and regions in causal contact expand so as to be beyond each other's horizons. Heisenberg's uncertainty principle predicts that during the inflationary phase there would be quantum thermal fluctuations, which would be magnified to cosmic scale. These fluctuations serve as the seeds of all current structure in the universe. After inflation, the universe expands according to Hubble's law, and regions that were out of causal contact come back into the horizon. This explains the observed isotropy of the CMB. Inflation predicts that the primordial fluctuations are nearly scale invariant and Gaussian which has been accurately confirmed by measurements of the CMB. Big Bang theory: The flatness problem. The overall geometry of the universe is determined by whether the Omega cosmological parameter is less than, equal to or greater than 1. From top to bottom: geometry in a closed universe, an open universe and a flat universe. The flatness problem is an observational problem that results from considerations of the geometry associated with a Friedmann-Lemaître-Robertson-Walker metric. In general, the universe can have three different kinds of geometries: hyperbolic geometry, Euclidean geometry, or elliptic geometry. The geometry is determined by the total energy density of the universe (as measured by means of the stress-energy tensor): hyperbolic results from a density less than the critical density, elliptic from a density greater than the critical density, and Euclidean from exactly the critical density. The universe is required to be within one part in 1015 of the critical density in its earliest stages. Any greater deviation would have caused either a Heat Death or a Big Crunch, and the universe would not exist as it does today. A possible resolution to this problem is again offered by inflationary theory. During the inflationary period, spacetime expanded to such an extent that any residual curvature associated with it would have been smoothed out to a high degree of precision. Thus, it is believed that inflation drove the universe to be very nearly spatially flat. Big Bang theory: Magnetic monopoles. The magnetic monopole objection was raised in the late 1970s. Grand unification theories predicted point defects in space that would manifest as magnetic monopoles with a density much higher than was consistent with observations, given that searches have never found any monopoles. This problem is also resolvable by cosmic inflation, which removes all point defects from the observable universe in the same way that it drives the geometry to flatness. It is not yet understood why the universe has more matter than antimatter. It is generally assumed that when the universe was young and very hot, it was in statistical equilibrium and contained equal numbers of baryons and anti-baryons. However, observations suggest that the universe, including its most distant parts, is made almost entirely of matter. An unknown process called baryogenesis created the asymmetry. For baryogenesis to occur, the Sakharov conditions, which were laid out by Andrei Sakharov, must be satisfied. They require that baryon number be not conserved, that C-symmetry and CP-symmetry be violated, and that the universe depart from thermodynamic equilibrium. All these conditions occur in the Standard Model, but the effect is not strong enough to explain the present baryon asymmetry. Experiments taking place at CERN near Geneva seek to trap enough anti-hydrogen to compare its spectrum with hydrogen. Any difference would be evidence of a CPT symmetry violation and therefore a Lorentz violation. Big Bang globular cluster age. In the mid-1990s, observations of globular clusters appeared to be inconsistent with the Big Bang. Computer simulations that matched the observations of the stellar populations of globular clusters suggested that they were about 15 billion years old, which conflicted with the 13.7-billion-year age of the universe. This issue was generally resolved in the late 1990s when new computer simulations, which included the effects of mass loss due to Stellar winds, indicated a much younger age for globular clusters. There still remain some questions as to how accurately the ages of the clusters are measured, but it is clear that these objects are some of the oldest in the universe. Big Bang theory: Dark matter. A pie chart indicating the proportional composition of different energy-density components of the universe, according to the best CDM model fits. Roughly ninety-five percent is in the exotic forms of Dark matter and Dark energy. During the 1970s and 1980s, various observations (notably of galatic rotation curves) showed that there was not sufficient visible matter in the universe to account for the apparent strength of gravitational forces within and between galaxies. This led to the idea that up to 90% of the matter in the universe is not normal or baryonic matter but rather Dark matter. In addition, assuming that the universe was mostly normal matter led to predictions that were strongly inconsistent with observations. In particular, the universe is far less lumpy and contains far less deuterium than can be accounted for without dark matter. While dark matter was initially controversial, it is now a widely accepted part of standard cosmology due to observations of the anisotropies in the CMB, galaxy cluster velocity dispersions, large-scale structure distributions, gravitational lensing studies, and X-ray measurements from galaxy clusters. In August 2006, dark matter was definitively observed through measurements of colliding galaxies in the Bullet cluster. This and other detections of dark matter are only sensitive to its gravitational signature; no dark matter particles have yet been observed in laboratories. However, there are many Particle physics candidates for dark matter, and several projects to detect them directly are underway. Big Bang theory: Dark energy. In the 1990s, detailed measurements of the mass density of the universe revealed a value that was 30% that of the critical density. Since the universe is very nearly spatially flat, as is indicated by measurements of the Cosmic microwave background, about 70% of the energy density of the universe was left unaccounted for. This mystery now appears to be connected to another one: Independent measurements of type 1a supernovae have revealed that the expansion of the universe is undergoing a non-linear acceleration. To explain this acceleration, General relativity requires that much of the universe consist of an energy component with large negative pressure. This Dark energy is now thought to make up the missing 70%. Its nature remains one of the great mysteries of the Big Bang. Possible candidates include a scalar cosmological constant and quintessence. Observations to help understand this are ongoing. Results from WMAP in 2006 indicate that the universe is 74% dark energy, 22% dark matter, and 4% regular matter (see external link). The future according to the Big Bang theory: Ultimate fate of the universe. Before observations of dark energy, cosmologists considered two scenarios for the future of the universe. If the mass density of the universe is above the critical density, then the universe would reach a maximum size and then begin to collapse. It would become denser and hotter again, ending with a state that was similar to that in which it started-a Big Crunch. Alternatively, if the density in the universe is equal to or below the critical density, the expansion would slow down, but never stop. Star formation would cease as the universe grows less dense. The average temperature of the universe would asymptotically approach absolute zero-a Big Freeze. black holes would evaporate. The Entropy of the universe would increase to the point where no organized form of energy could be extracted from it, a scenario known as Heat Death. Moreover, if proton decay exists, then hydrogen, the predominant form of baryonic matter in the universe today, would disappear, leaving only radiation. Modern observations of accelerated expansion imply that more and more of the currently visible universe will pass beyond our Event horizon and out of contact with us. 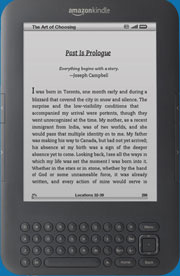 The eventual result is not known. The CDM model of the universe contains Dark energy in the form of a cosmological constant. This theory suggests that only gravitationally bound systems, such as galaxies, would remain together, and they too would be subject to Heat Death, as the universe cools and expands. Other explanations of dark energy - so-called phantom energy theories - suggest that ultimately galaxy clusters and eventually galaxies themselves will be torn apart by the ever-increasing expansion in a so-called Big Rip. Speculative physics beyond the Big Bang theory. A graphical representation of the expansion of the universe with the inflationary epoch represented as the dramatic expansion of the metric seen on the left. Image from WMAP press release, 2006. While the Big Bang model is well established in cosmology, it is likely to be refined in the future. Little is known about the earliest universe, when Inflation is hypothesized to have occurred. There may also be parts of the universe well beyond what can be observed in principle. In the case of inflation this is required: exponential expansion has pushed large regions of space beyond our observable horizon. It may be possible to deduce what happened when we better understand physics at very high energy scales. Speculations about this often involve theories of quantum gravitation. 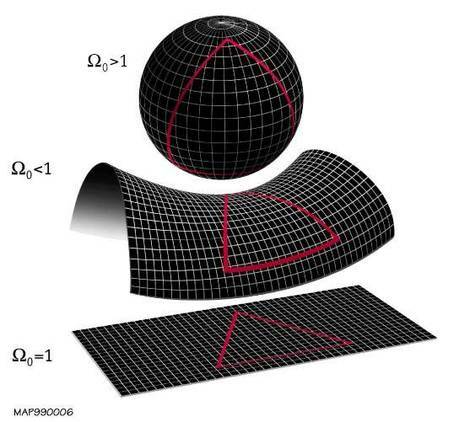 models including the Hartle-Hawking boundary condition in which the whole of space-time is finite;. brane cosmology models, including brane inflation, in which inflation is due to the movement of branes in string theory; the pre-big bang model; the ekpyrotic model, in which the Big Bang is the result of a collision between branes; and the cyclic model, a variant of the ekpyrotic model in which collisions occur periodically. chaotic inflation, in which inflation starts from random initial conditions for the universe. Some of these scenarios are qualitatively compatible with one another. Each entails untested hypotheses. Philosophical and religious interpretations of the Big Bang theory. The Big Bang, as a scientific theory, is not based on any religion. However, it does have both theological and philosophical implications, since some religious interpretations and world views conflict with the Big Bang origin of the universe. There are a number of interpretations of the Big Bang theory that go beyond science, some of them purporting to explain the cause of the Big Bang itself (first cause). These views have been criticized by some naturalist philosophers as being modern creation myths. Some people believe that the Big Bang theory is inconsistent with traditional views of creation such as that in Genesis, for example, while others, like astronomer Hugh Ross, believe that the Big Bang theory lends support to the idea of creation ex nihilo. Initially, many scientists rejected the Big Bang theory because they thought it was religious in nature. The prevailing view at the time was that the universe was eternal, having always existed. Some felt the idea that the universe had a beginning would imply a creator (see Kalam cosmological argument), which would be unscientific. 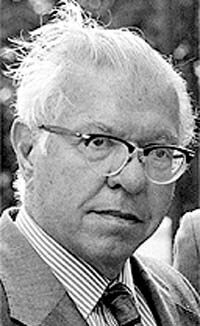 These connotations troubled astronomer Fred Hoyle and others, who developed the now discredited steady state theory as an alternative to the Big Bang which would allow for an eternal universe. Astrophysicist Arthur Eddington had no such qualms, arguing that evidence of a Big Bang and start to the universe made "religion possible for a reasonable man of science." A number of Christian and traditional Jewish sources have accepted the Big Bang as a possible description of the origin of the universe, interpreting it to allow for a philosophical first cause. Pope Pius XII was an enthusiastic proponent of the Big Bang even before the theory was scientifically well established and consequently the Roman Chatholic Church has been a prominent advocate for the idea that creation ex nihilo can be interpreted as consistent with the Big Bang. This view is shared by many religious Jews in all branches of rabbinic Judaism. Some groups, such as the Kabbalah Centre, contend the Big Bang is also consistent with the teaching of creation according to Isaac Luria and Kabbalah. Some modern Islamic scholars believe that the Qur'an parallels the Big Bang in its account of creation, described as follows: "Do not the unbelievers see that the heavens and the earth were joined together as one unit of creation, before We clove them asunder?" (Ch:21,Ver:30). The claim has also been made that the Qur'an describes an expanding universe: "The heaven, We have built it with power. And verily, We are expanding it." (Ch:51,Ver:47). Parallels with the Big Crunch and an oscillating universe have also been suggested: "On the day when We will roll up the heavens like the rolling up of the scroll for writings, as We originated the first creation, (so) We shall reproduce it; a promise (binding on Us); surely We will bring it about." (Ch:21,Ver:104). Certain theistic branches of Hinduism, such as in Vaishnavism, conceive of a creation event with similarities to the Big Bang. For example in the third book of the Bhagavata Purana (primarily, chapters 10 and 26), describes a primordial state which bursts forth as the Great Vishnu glances over it, transforming into the active state of the sum-total of matter ("prakriti"). Other forms of Hinduism assert a universe without beginning or end. Buddhism has a concept of universes that have no initial creation event, but instead go through infinitely repeated cycles of expansion, stability, destruction, and quiescence. The Big Bang, however, is not seen to be in conflict with this since there are ways to conceive an eternal creation and destruction of universes within the paradigm. A number of popular Zen philosophers were intrigued, in particular, by the concept of the oscillating universe. Big Freeze Universe becomes too cold to sustain life . Sciences View of the Big Bang. God and the Big Bang. Theories: - Science and the Universe. Model of the Universe: Big Bang. 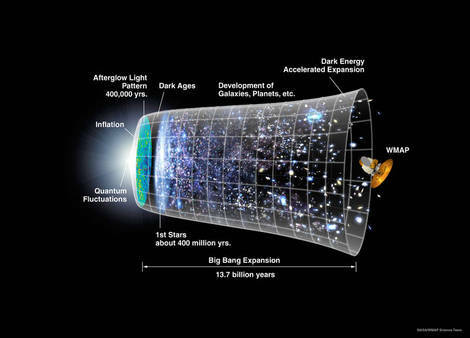 When Did the Big Bang Happen?. Gods Entry into the Universe. Big Bang Science : Full Essay: Page 1 of 3. Big Bang Singularity Questioned: Full Essay: Page 2 of 3. The Nothingness universe: Full Essay: Page 3 of 3. . The Nothingness: Full Essay by English Philosopher PM Crowley. The Universe and the Big Bang Theory Rewritten: Summary.